19:25 "They said to him, 'Lord, he has ten minas!' 19:26 'For I tell you that to everyone who has, will more be given; but from him who doesn't have, even that which he has will be taken away from him. 19:27 But bring those enemies of mine who didn't want me to reign over them here, and kill them before me.'" 19:28 Having said these things, he went on ahead, going up to Jerusalem. 11:55 Now the Passover of the Jews was at hand. Many went up from the country to Jerusalem before the Passover, to purify themselves. 11:56 Then they sought for Jesus and spoke one with another, as they stood in the temple, "What do you think—that he isn't coming to the feast at all?" 11:57 Now the chief priests and the Pharisees had commanded that if anyone knew where he was, he should report it, that they might seize him. Some Gospel harmonies insert here the Bethany supper with Lazarus, following the sequence found in John’s account. Like many others, I place it on page 208, following the sequence related by Matthew and Mark. Bethany was adjacent to Jerusalem, so during these final days of Jesus’ ministry Jesus and the twelve could spend each day in Jerusalem and then dine and sleep in Bethany. (Compare Mark 11:11, 19 and Matt. 21:17.) 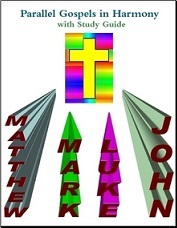 John’s sequence can be understood as a topical arrangement, rather than a conflict with the chronology of Matthew and Mark.